Two unknown men speak on the phone. They discuss their involvements in military operations in eastern Ukraine, accompanied by images of a chaotic stroll through a nightly, Russian forest. A plane passes through the moonlit night sky, and a voice recites a poem by Anna Akhmatova, while a woman, in near darkness, looks at herself in the black mirror of her computer screen. Then, she looks at us. Enter the strange and deceptive world of “The Sprawl,” Metahaven’s feature debut film. Silent sword fighters stare at us. Silent actors look at us. They gaze at their screens, and at the deepest corners of YouTube. Strange and colorful interfaces overlay their appearance until medium and message become one. Together with master cinematographer Remko Schnorr and electronic musician Kuedo, Metahaven in “The Sprawl” create a new visual world for the internet’s geopolitical agitprop. Nowadays, films live in a thousand and one forms on the internet. As short trailers, fragments, cloud-based copies of copies, endangered data, self-hosted vaults, and so on. Viewing cinema on a laptop screen is only possible when remembering that such an experience has little to do with cinema itself. As a hybrid, episodic documentary, “The Sprawl”‘s story isn’t linear. The film lends itself to be seen as a succession of impressions—a trailer, forever unfinished; the duration of each of those video pieces, or “shards,” is attuned to an attention span that is cinema and more internet. sprawl.space is the online interface for The Sprawl, where the viewer can see the “shards” that make up the full version of the film. The website has been shaped by the interface design of Metahaven and the viewing algorithms of YouTube. Find us on Twitter, Tumblr, YouTube, Vimeo and Instagram. Immersive video installation, exhibited as part of the 50th anniversary edition of the Brighton Festival. 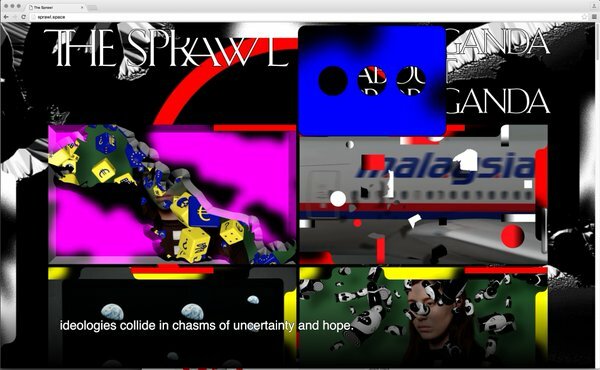 The Sprawl is one of four winning projects selected for the first Open Call by The Space, a joint BBC and Arts Council England commissioning body supporting art that employs technology to push the boundaries of creative expression.